A thread that began on the LANDTRUST-L listserv early in December 2011 had an outlier, a late post, a couple of days ago. 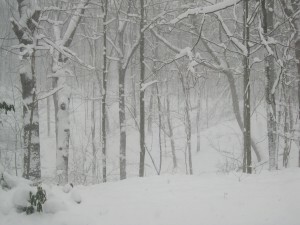 I read it over this afternoon as the first good-sized snow of the winter was falling–9 inches but slowing down. The thread had to do with term limits for land trust board members and the familiar points were covered–well covered as is generally the case for nuts-and-bolts land trust issues on this listserv. The virtues of bringing in new blood as against losing capable veterans were compared. The difficuly of finding good new contributing members was mentioned as well as the need for a committee to profile desirable skills and locate candidates. Ways of retaining involvement of former board members that had been term-limited off were suggested. Different land trusts handled things differently, but if there was a consensus, it was that term limits, despite bringing some problems that had to be dealt with, were a good thing. It would be hard to disagree with such a moderate position. Term limits can have several good effects and only a few bad ones. And a land trust that is a going concern in a market of reasonable size can almost always recruit competent new board members if the nominating committee is doing its job. Something that has occurred to me after watching a lot of boards from chamber music to bird clubs is that only one class of board member is irreplaceable. The irreplaceable class is the founders. I make this suggestion not in a spirit of contention but as a serious observation. There are founders and founders. Some people are founders because they’re a friend of one of the real founders or they’re an accountant or have a good permanent mailing address or have a friend at the local foundation. All of these are good traits for board members. But the founders to me are the ones with the zeal. They’re the ones with the vision of the organization’s role, the knowledge of the enterprise, the sense of rightness of the task, and the persistence to fill out the forms, rent the hall, and actually produce a new organization. Some new board members develop some of these attributes. Some don’t, though they may do a lot of governance or a lot of cheer leading. I would make an exception to a term limits rule to make it possible for any founder to serve on the board as long as and whenever he or she chose to. The point is to keep the founder traits and also to keep the the institutional history readily accessible. Not everybody will agree. In fact, one of the main motivations for term limits–soft-pedaled in the moderate discussions of the listserv–is to get rid of the old-timers with their baggage of stoutly held outmoded ideas of how things ought to be done. Non-profit-board experts have identified two evolutionary trends. Boards start out as a bunch of activists who know the subject. In the course of time they are replaced by policy-setter types with influence in the community. And pari passu the work of the organization shifts from volunteers to paid staff. These two trends are definite and immutable, as certain as the development of a sunburn from too much time at the beach. In one article on non-profit board development I saw, the condition of having founders remaining past their pull-by date was referred to as Founders’ Syndrome, indicating the seriousness of the affliction. My view is that, despite occasional bull-headness, cantankerousness, and failure to go with the flow, founders may bring features hard to find elsewhere. Not an invitation for argument, just a rumination from a snowy afternoon. Happy New Year to founders and non-founders alike. The essay that follows is a radio address by Leslie Alva Kenoyer, who served from 1922 to 1953 as Professor and Chairman of the Biology Department at Western Michigan University –at that time Western State Teachers College . The piece is dated April 16, 1935. It was written for Western’s Radio Hour, which was evidently a continuing feature on station WKZO. The sentiment that inspired this poem has not been firmly enough established in the minds of southern Michigan people to save from destruction any more than the most scattered remnants of our once beautiful and glorious forest lands. Some fifty thousand years ago the great continental glacier receded from what is now Michigan leaving a raw and barren glacial clay, streaked here and there with sand and gravel. Such soil, in the cool climate then found here, could support only a meager arctic vegetation, consisting of such low, spreading plants as we find today in our cold bogs. The rain and sun gradually brought about favorable chemical changes in the soil and the plants gradually decayed to form humus, hence, in the course of a few centuries, the scant arctic vegetation was replaced by larger shrubs. Centuries later trees occupied the ground, starting with the poplars and developing from stage to stage to dense shady forests of beech and sugar maple. such as covered much of southern Michigan 110 years ago when the government divided our land into townships and sections. It was inevitable that the trees should succumb to the lumberman’s axe, when the land was cleared for farm homesteads, but it is particularly unfortunate that their removal should have been so complete. Indeed we have here and there a small woodlot to serve as a rather meager sample of the forests that were. but larger tracts are now exceedingly scarce. One of the finest and most extensive remaining areas is Newton Woods in Cass County, adjoining the road from Decatur to Cassopolis, and not far from the village of Volinia. Here are several hundred acres of practically virgin timber, including large blocks of both the beech-maple and oak-hickory types of timber. 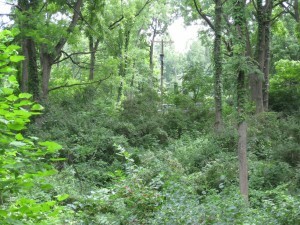 The trees of this forest were large long before southern Michigan was surveyed and opened to the settler. Among them is an elm which now lifts its head to the majestic height of 150 feet and has a circumference. three feet above ground of 24 feet [91-92 inches in diameter]. Some believe it to be the largest tree now standing in Michigan. There is also a magnificent group of giant tulip or whitewood, the largest of which is 145 feet high, 90 feet to the first branch and 30 feet in circumference [114-115 inches in diameter]. It takes three to five centuries to grow such trees as these. Ten years ago we could see from our college campus, at a distance of eight or nine miles, a stately elm, towering far above the other trees. Suddenly this tree ceased to be seen, and we learned that it had been sold for $100 for the manufacture of barrel staves. On visiting the stump and counting the rings of growth, I found that the tree was considerably over 400 years old. It was a sapling when Columbus crossed the Atlantic in his puny sailing vessels. Probably the barrels have worn out and the $100 has been long since spent and forgotten, but it will take 400 years to grow another such tree. When a forest is cut, it is not only the trees that go. The shrubs and the herbs, the orchids and other rare plants, the mosses and lichens that form the turf, will not live when deprived of the shade of the trees. The disappearance of this ground cover permits the erosion of the soil, which represents the accumulation of many thousands of years. The insects, the birds, and the beasts are dislodged from their accustomed haunts, many of them to perish. Hence the restoration of a denuded area cannot be accomplished by the mere planting of trees, nor does a planted forest ever prove a satisfactory substitute for a destroyed native forest. The old conditions will not and cannot be restored, once the forest is gone. How, then, will the next generation know anything of the beauties and glories of the forest with its wonderful variety of plant and animal forms This is a question which our generation must answer. A part of the Newton Woods is now in the hands of a lumber company and some cutting has already been done, but there is a chance that it may yet be rescued if the public will take sufficient interest in its preservation. The lumber firm is kindly witholding operations in view of an aggressive campaign that is now being sponsored by the Michigan Academy [of Science, Arts, and Letters], the Michigan Forestry Association, and other organizations and individuals who feel that the value to the people of such reserves for the continuation of our wild life is one that cannot be measured in mere dollars. The present leader of this movement is Shirley W. Allen, University of Michigan, Ann Arbor. Professor Allen would like to hear from all who are interested in finding some means to save the tract. It is well to bear in mind that our present state parks are mostly in northern Michigan remote from centers of population. Here is a real wilderness with immense trees, a small stream, a profusion of wild flowers, birds, and other natural beauties easy of access to a million people. 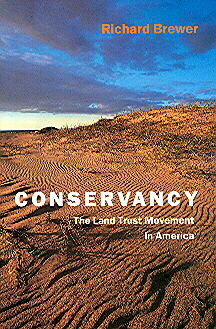 We cannot blame property owners for wishing to realize from their investments, but we deplore the fact that the people are not awake to the desirability of keeping the few remaining bits of out landscape as nature gave them to us, free from the artificial modifications imposed by farm and city development. With an awakened public, our officials and our public-spirited citizens of means would put forth the necessary efforts to save from the general destruction these remnants of wild nature for the instruction and enjoyment of generations yet to come. Kenoyer’s comments on post-glacial vegetation change hold up well enough as a broad pattern. However, the quoted estimate of 50,000 years ago since the last ice sheet melted from southern Michigan is too high. Something on the order of 15,000 years would be closer to the interval based on current evidence. I like Kenoyer’s plea for protecting natural areas “for the enjoyment and instruction” of later generations. If I were to revise it I might write “enjoyment, instruction, and health of our own and later generations.” But Kenoyer’s plea for land conservation was accurate and eloquent exactly as he wrote it and, in 1935 on a radio broadcast, far ahead of its time. Kenoyer received his Ph.D. in 1916, evidently done in some sort of joint arrangement between the University of Chicago and Iowa State University. He is credited with receiving the first Ph.D. granted by what was then The Iowa State College of Agriculture and Mechanic Arts. Kenoyer’s thesis research dealt with environmental influences on nectar secretion. This and his research interests as shown in later life seem clearly in line with the work being done at Chicago by Henry Chandler Cowles and the other faculty and graduate students. Kenoyer was born in 1883 in Dover, a small community in north-central Illinois. After completing his Ph.D., he taught botany in India for six years, then spent a year at Michigan State before coming to Kalamazoo. 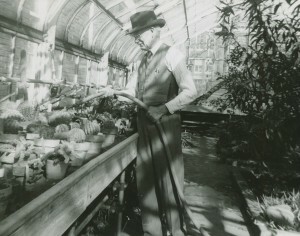 He became head of the Biology Department soon after arriving, when LeRoy H. Harvey died. Whether Kenoyer and some of the other individuals and groups who worked to preserve Newton Woods 75 years ago would be wholly be satisfied with the outcome is not certain. In the preceding post, the question of why President Obama rebuffed the stronger ozone standards proposed by the Environmental Protection Agency was left unresolved. Now we have the answer. 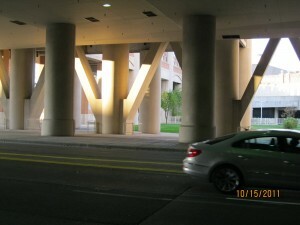 The Kalamazoo Gazette for 2 November 2011 reprinted an article from the Washington Post by Ned Martel. The Gazette reprint was titled Upton Changing for good of GOP? Longtime moderate shedding conciliatory ways at key time for his party. The topic was the supposed slide to the right by Fred Upton. Upton, an heir to the Whirlpool fortune, has served as the U. S. Representative from southwestern Michigan since 1987. He’s had something of a reputation as a moderate since his first campaign in 1986. In fact, Howard Wolpe, a Democratic icon from Kalamazoo, recounts how he advised Upton in that campaign, the 1986 Republican primary in which Upton beat the conservative incumbent, Mark Siljander. Maybe Fred has changed his stripes, as Wolpe and others have suggested. But I’m doubtful; the bulk of Upton’s voting record has always been that of a conservative Republican. Occasional deviations from the Republican party line may well have been sanctioned by the Republican leadership on a few bills where it was clear his vote would make no difference–that is, on issues where the Republicans were already certain to win by a large margin or lose by a large margin. An alternative interpretation of Fred’s move is that in recent years, with the various changes in Congressional districts and boundaries, Michigan’s 6th Congressional district has so many Republicans he no longer needs votes from the blue sections and can stop pretending. Whether it’s a real change or just the end of dissimulation means little–except possibly to some of the moderates or liberals who voted for Fred in earlier elections. And there we have it. Fred pushed, Obama jettisoned, and Lisa smiled no more. President Obama made two serious mistakes early this fall. First, he told the Environmental Protection Agency to withdraw new, stronger, standards for ozone levels in the lower atmosphere that were intended to replace the standards held over from the Bush administration. Ozone (O3) is an atmospheric pollutant dangerous to human health because it’s highly reactive in lung tissues. It’s involved in various respiratory diseases but evidently also in other sorts of human pathology; for example, it’s believed to contribute to the development of atherosclerosis. But ozone in the lower atmosphere also has many bad effects besides just our own health and life span. It damages plants, lowering photosynthesis and growth and is implicated in die-offs of forest trees. Ozone is produced in the lower atmosphere by reactions between nitrogen oxides and volatile organic compounds in the presence of sunlight. The nitrogen oxides and volatile organic compounds come mostly from power plants, various sorts of factories, automobiles, gasoline vapor, and chemical solvents. There are interactions between ozone production and temperature and ozone effects and temperature, such that we get more ozone produced and stronger effects when temperatures are high. These are one of many kinds of interactions that may make global warming an even greater calamity than most of the early predictions claimed. President Obama’s second mistake was his reason for turning down the new, science-based ozone recommendations. He said he wanted to reduce regulatory burdens and regulatory uncertainty. But tough regulations strictly enforced are what can make capitalism work. The last few years have shown us repeatedly how things go astray when politicians manage to weaken and thwart regulations. Weakened regulations together with the unwillingness of federal agencies to enforce existing regulations were the main causes of the financial fiasco of 2007-2009 and the recession that came with it. Michigan has been on the deregulation bandwagon right along. In the DooDah parade of deregulation, it may even have been ahead of the bandwagon. We had a governor a few years ago whose slogan was “Less enforcement, more compliance.” Such a proposition if it were sincere would be fatuous, but considering everything, just calling it preposterous or ludicrous will probably have to serve. President Obama seems to have accepted the argument of the extreme political right that there is a conflict between “the environment” and “the economy.” For most Americans, the right wing lost on that issue 30 or 40 years ago. Some corporations tell us if the nation doesn’t give them lax environmental rules they’ll take their jobs overseas. Since such corporations show little national loyalty, some have. But the balance sheet we need to look at is the overall gain to our nation in terms of clean air and water, healthy citizens, healthy communities, and healthy ecosystems compared with the cost of meeting any given environmental standard. Time after time we’ve seen that the costs of meeting new standards turns out lower than the company’s forecast, that new jobs are created connected with the improved technology needed, and that the overall national cost/benefit ratio is heavily in favor of the tougher standards. Anyone who’s been paying attention anytime these past 40 years knows that. Why doesn’t the President? President Obama has another environmental decision coming up soon. This is to accept or reject the proposed Keystone XL pipeline that would carry a form of crude oil processed from Canadian tar sands from Alberta to the U.S. Gulf Coast. I hope to write more about this a little later. 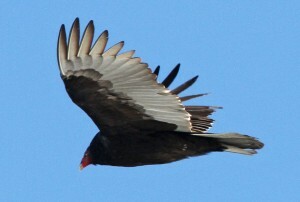 Turkey Vulture in flight. Photo Kalamazoo MI by Tim Tesar. Used by permission. trees, followed by a Blue Jay. I had just seen crows along the road, so it was evident that this bird was much larger than a crow and larger than any buteo. It was, in fact, a Turkey Vulture, the first I had seen actually within the woods in the 15-plus years since I arrived. What, I wondered, was it doing here? Then the answer struck me. The folk wisdom in southern Illinois, where I grew up, was that vultures, or buzzards, find carrion by the smell of rotting meat. But birds in general have a poor sense of smell, and the olfactory lobe of the brain, which is associated with smell, is large in mammals like us, but small in most birds. Then too, John James Audubon, an excellent naturalist as well as painter of birds, did a few trials in the early part of the 19th century, trying to assess how vultures found food. His observations of vultures failing to find hidden carrion led him to the conclusion that dead carcasses were located by sight. “The power of smelling in these birds had been greatly exaggerated,” he wrote. Other observations didn’t always agree with Audubon’s conclusion. By 1964, an article by Kenneth E. Stager of the Los Angeles County Natural History Museum summarized his and other studies that pretty well established the main features of how vultures find their meals. In broad outline, Aububon wasn’t wrong, but he had worked mainly with Black Vultures (Coragyps atratus), which do locate food visually, either by spotting it themselves or watching Turkey Vultures (Cathartes aura). Turkey Vultures, it turns out, have a well-developed sense of smell which they can use to find even small animals that are not visible from the sky. They also have large olfactory lobes. Of course, they are not above gliding down to a dead animal they see lying out in plain sight. There are some other details that may or may not have been decided in the last few years, such as whether either or both vultures can use the sight (or the sound) of carrion-feeding insects going to a dead animal as a clue to the corpse’s presence. Earlier this morning before 9 AM, when I was walking down the driveway to get the newspapers, I had caught a strong smell of carrion. 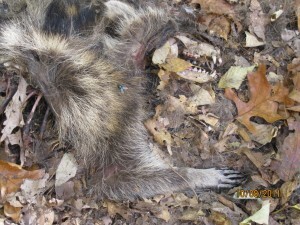 I left the driveway and only a few steps into the woods found a dead raccoon. I didn’t examine it carefully and have no idea how it met its death. When I had walked past the same spot several times yesterday, I had not smelled a dead raccoon. It was not there, or it was too fresh. Finding a Turkey Vulture near a dead raccoon that it could not have seen from the sky doesn’t qualify as an important piece of evidence on the topic, Nevertheless, I was pleased that an observation of my own, right here in Oshtemo Township, is so nicely congruent with modern thinking on how the Turkey Vulture finds its food. When I pulled up at the front door, I looked back and the Turkey Vulture had already returned to the trees above the dead raccoon. I ducked into the house, not wanting to interrupt the bird’s meal any longer. A few hours later, I checked the carcass. The skull, vertebral column, and limbs had been stripped clean, and the skin was clean and much of it was inside out. Today is a good time to take a walk in the forest, but then any time is. It’s a really good time for a walk in the beech-maple forest, because a very rare orchid blooms this time of year. The orchid is three birds orchid (Triphora trianthophora). It’s known from Kalamazoo County and in fact from much of the eastern U.S., but in most places it has become rare. It is now considered threatened, endangered, or extirpated in most states. The last record in Michigan was evidently in 1981, from Berrien County. It’s possible that three birds is gone from Kalamazoo County and Michigan. Perhaps the observations in the 20th century just caught the tail of a population dwindling toward extinction–in this region; three birds seems a little more numerous in the South. However, there are some reasons why not many people are out looking in the beech-maple forests when it’s visible, and also some reasons why, even if you’re there, three birds isn’t necessarily easy to spot. mostly sugar maple, or with thick foliage of ferns, wood nettle (Laportea), wild ginger, and a few other herbs. Three birds is a short plant, 6 inches or thereabouts, so I imagine in the shade and under the foliage, it’s not easy to see. Nevertheless, considering how important rediscovering the species would be, if you can get to a beech-maple forest in the next few days, you ought to give it a try. There is much yet to learn about the habitat and life history of three birds. Within its mesophytic forest home, it’s said to favor sites where there’s a build-up of leaf litter and humus. Probably this means small depressions. Leaves accumulate other places, such as between two large fallen trunks, but I’m not sure if that microhabitat would be long-lived enough to allow time for the orchid to invade. But maybe it would. From observations of the Michigan botanist Fred Case in his Orchids of the Western Great Lakes Region (Cranbrook Institute of Science, 1987), I suspect that most dispersal is through underground tuberoids that are dug up, carried off, and stored in the duff and litter by red squirrels, or perhaps chipmunks. The flowers (often three per plant) are recognizably orchids but small, perhaps about an inch wide and an inch tall and are mostly whitish or pinkish with a greenish bearded stripe on the lip. The fruits last for a couple of weeks before slits develop that allow the release of the spore-like seedsin the following days. Although the plants are not at their showiest when they’re in fruit, this is the probably the longest period of their above-ground life. You can see how the plant looks with fruit at this Connecticut Botanical Society site with photos by Eleanor Saulys. 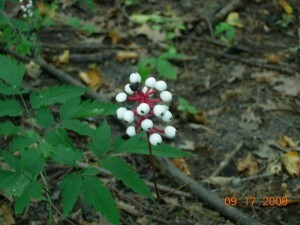 The same site shows some plants in flower. Many more photos of flowering plants by Jim Fowler are shown at the North Carolina site linked to earlier. So, have a look at the photos and head for the nearest beech-maple forest. If you find three birds orchids, please tell us about it in the comments section. But don’t mention exactly where you found them. (If you do give information that might allow someone to locate them, I’ll edit your comment to remove those details.) Rare plants, especially such things as orchids, have been known to disappear from sites that become known. However, you should let the Michigan Natural Features Inventory know. They’ll be tickled that three birds is not extinct in Michigan.–as will we all. Whether the stable population will be 1.5 billion or 5 billion, the question is: How do we get there?… I have no doubt we’re going to have a bad hundred years. We have the resources to gracefully handle the transition, but we won’t. We apparently can’t. Jeremy Grantham is an investment strategist who has specialized in identifying bubbles–Japanese stocks in the 1980s, dot-com corporations in the 1990s, housing in 2008. It appears that he has come to see the current world population size as a bubble. If so, he may have reached roughly the same position as Richard Heinberg, senior fellow at the Post Carbon Institute, who has suggested that we have passed or are about to pass, not just peak oil, but peak everything. Heinberg published a 2007 book called just that, Peak Everything. Of course, peak oil is the trigger. As fossil fuel energy becomes more expensive, everything gets harder to do. Mining, food production, transportation and travel, providing potable water, all become more expensive, and eventually too expensive. 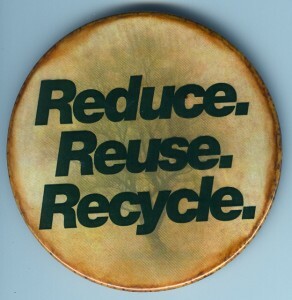 That there is such a thing as a carrying capacity for humans and that exceeding this carrying capacity can lead to degradation of the environment in such a way that the carrying capacity is itself reduced are not new ideas. Thomas Malthus, William Vogt, Garrett Hardin, and Paul Ehrlich are a sampling of those who made the case from 1798 to 1968. But the idea that there can be too many people is not popular, and such words as “overpopulation” and “population control” and “ZPG” have not been heard much in the U.S. since the 1970s. Will enough people connect the coming shortages and rising prices of potassium and phosphates and other such shortages and dislocations with global climate change resulting from overpopulation (combined with our energy technology and corporate/political system)? Possibly. Grantham’s newsletters posted on the website of his investment management firm make the connections. 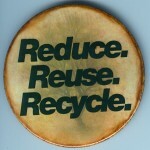 Here is a link to the July 2011 newsletter, Resource Limitations 2: Separating the Dangerous from the Merely Serious. At a time in southwest Michigan when protecting all our remaining natural lands and waters would make sense for human health and economic viability, threats continue. This morning I received the message copied in boldface below from the Saugatuck Dunes Coastal Alliance. It is their updated look at the controversy involving the Lake Michigan sand dunes and beaches north of the mouth of the Kalamazoo River at Saugatuck, Allegan County, Michigan. 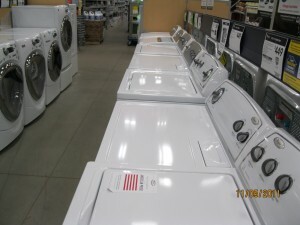 Background information is available at the Alliance’s website . A December 2010 Wall Street Journal article, A Billionaire’s Dune Duel, is also informative. Some history, including the hope to have protected public lands from the Oval Beach north through Saugatuck State Park, is given at the website of the Concerned Citizens for Saugatuck State Park. We want to take a moment to alert you to what is currently happening to defend local zoning in the Saugatuck area. On July 22nd the Saugatuck Township Board appeared to ignore four hours of testimony by many well-informed township residents asking them to consider all other possible solutions to the proposed settlement between Aubrey McClendon and Saugatuck Township to the on-going federal lawsuit. The Township Board unanimously passed the settlement. 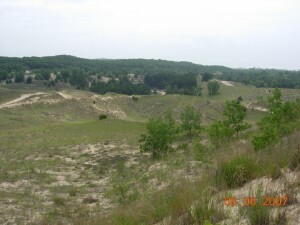 On July 29th three local groups – Saugatuck Dunes Coastal Alliance, Laketown Alliance for Neighborly Development and the Kalamazoo River Protection Association – file a request for Judge Maloney to hold a fairness hearing. A fairness hearing, which is common in many different types of cases that affect communities or large numbers of third-parties, is used to ensure consent decrees are fair, reasonable and legal, and in the public interest. Our belief is that the proposed consent decree does not meet these standards and should, therefore, be rejected by the court. On July 29th the National Trust for Historic Preservation also file a request for a fairness hearing. The National Trust is represented by Kalamazoo-based law firm Miller Canfield. On August 1st several Township residents who live close to the McClendon property also file papers requesting a fairness hearing. The neighbors are represented by Grand Rapids-based law firm Varnum. On Monday, August 8th additional neighbors, one of whom is completely surrounded by McClendon’s land, sign onto the request for a fairness hearing filed by Varnum. We have taken this step (filing for a fairness hearing on July 29th) as we believe that this proposed consent decree is illegal because it circumvents local zoning laws, violates the State-mandated rezoning process, and blocks the Saugatuck Township Board’s oversight of the development. To put it simply, the fundamental problem with the proposed settlement is that it includes provisions that neither Mr. McClendon nor the Township Board has the legal authority to do on their own. That is, they have overridden local zoning regulations without a proper process and they have approved a commercial development that is not permitted under current zoning and would also have not been permitted under the property’s previous zoning. Under Michigan law, zoning ordinances should be based on the applicable master plan. The proposed consent decree, however, permits commercial-type uses that are clearly prohibited by the Township’s zoning ordinance and the Tri-Community Comprehensive Master Plan. It does this without any proper process or prior consultation with the Cities of Saugatuck and Douglas, the two other jurisdictions that participated in the development of this Master Plan. Additionally, under this settlement, the Township has contracted away its legislative powers now and in the future in violation of Michigan law. Furthermore, the Township Board reached the decision to accept the settlement under duress. This proposed settlement is not a “compromise” as touted by the McClendon team. It is, in fact, a “take it or leave it” offer, made after the Township was forced to incur hundreds of thousands of dollars of legal expenses, and then threatened with never ending legal expenses in the future. Only then did the Township capitulate to Mr. McClendon’s demands. We appreciate the pressure the Township Board has been under and the difficult decision they were faced with. But this settlement sets a dangerous precedent because it suggests that there is one set of rules for investors with deep pockets who are willing to threaten the Township with bankruptcy and another set of rules for everyone else. With the various requests for a fairness hearing, the community is stating publicly and before the Court that this proposed consent decree is unfair and illegal and should be set aside by the court. We understand that many in the community are concerned about the costs of further litigation and the unfortunate divisions that this development proposal has caused in our community. As a practical matter, we agree that a fair settlement should be negotiated. That is why we are also calling on the township to propose to Mr. McClendon a mediation process, such as proposed by former Senator Birkholz, in order to reach a fair and legal settlement. We understand that Mr. McClendon owns the property and has a right to develop it. We only ask that it be developed in a manner that is consistent local zoning laws. Many of you are asking how you can help. Thank you! One important thing everyone can easily do is send this update out widely, post on facebook, and remind people that this issue is far from over. 1. The Coastal Allliance supports all property owners’ rights to develop their land legally and appropriately. 2. The Coastal Alliance supports locally determined zoning. 3. Aubrey McClendon sued Saugatuck Township to rewrite zoning laws. It’s worth noting that the Master Plan, from which these zoning laws originated, was unanimously approved by Saugatuck Township, Saugatuck City, and Douglas. Eastern Towhee breeding habitat is forest edge with brushy patches and usually including areas covered by leaf litter. Nests are often on the ground under brush. 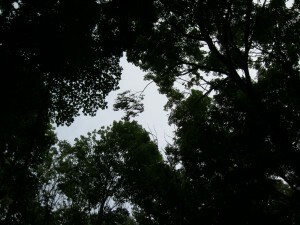 Photo in Oshtemo Township MI 7 July 2011 by Richard Brewer. My hearing is not as good as it was ten or twenty years ago, mainly for high notes. That’s one reason I was pleased to hear an Eastern Towhee singing today when I walked down to get the newspapers. It took me a moment to identify the song. One problem with losing the high notes is that, though you can still hear many songs, some may be hard to recognize when you’re hearing only the medium and low notes. There was another reason I had to listen for a couple of repeats to identify this song. The towhee song is traditionally rendered as “Drink your tea,” with the first note high, the second lower, and the third a trill, so it’s something like “Drink your tea-ee-ee-ee-ee.” It’s an easy song to learn, even for those of us who aren’t particularly musical. I thought this version would probably serve the male’s territorial defense needs. My wife, however, was doubtful that it would be as successful in attracting female towhees as the more conventional version. The name “towhee” comes from the bird’s voice, but not from the song. “Towhee” is one way to represent one of the common call notes of the species. To me, it generally sounds a little more like “T’wee.” “Chewink” is another representation of the same call note. In earlier, less standardized times, “Chewink” was used as an alternative name for the species. Saunders began to notice a deterioration in his ability to hear the high notes of bird songs around 1938 when he was in his mid-fifties. For me, the inability to hear bird voices like that of the Blue-winged Warbler if I’m more than a few feet away is a matter for regret. For someone like Saunders, such losses must be much sadder.